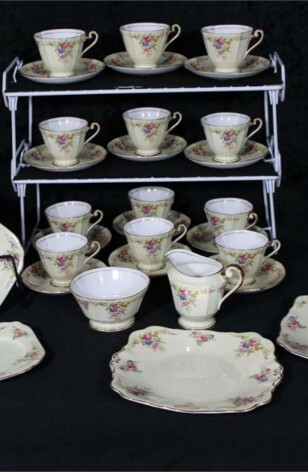 An Elegant Roslyn China Service for Twelve (short (2) Tea Plates). A Beautiful Floral Pattern. Pattern is on a Cream Background, with Yellow, Pink, Blue, Orange, White Flowers, and includes Green and Brown Leaves. Saucers are Round, but Cookie Platters are Square. All Pieces have 22k Gold on Rims, Feet, Handles and Inside Ring of Cups, Sugar Bowl and Creamer. Vintage - Roslyn Fine Bone China - Made in England, Produced in 1946 to 1950. A (40) Piece Set, Service for (12).